We will meet with you on site using our questionnaire (click here to load the pdf) as the foundation for guiding you through improving your landscape. These sessions are fun and relaxed, designed to give you, the homeowner, maximum input into the design process. In a one to two hour consultation, we will provide you with our notes, a detailed plant list and new bedlines painted on the ground. From this, the homeowner, is able to “do it yourself”, therefore saving money. 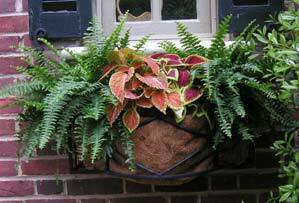 We offer planting designs, using summer annuals, for the containers that beautify your front porch, terrace and pool areas. 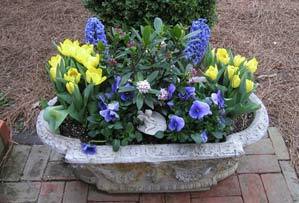 Our container planting designs will make your landscape “pop” with color. Do you need new containers? 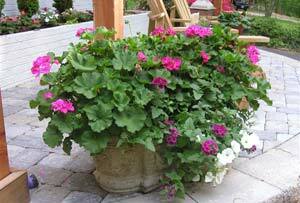 If so, we will assist you in choosing and purchasing containers that are appropriate to your landscape and home. Are you new to gardening? Did you just purchase a home with existing landscaping and not know what to do with it? Regardless of whether you are a young homeowner or a longtime homeowner with an interest in gardening, we can advise you. Garden maintenance, pruning times, container plantings, and identifying existing plants are just a few of the subjects we will discuss with you on site. We come prepared for this visit with work gloves and tools in hand. Have you been asked to have your home and garden open for Historic Garden Week? With over a dozen properties to our credit, we have many years of experience assisting homeowners in readying or creating new, lush gardens to be viewed by the hundreds of visitors who flock to Virginia for Garden Week and enjoyed for years to come. We will help walk you through the process starting a year in advance so that your open house experience will be enjoyable. Whether it is an hour consultation or a fully developed master plan, gift certificates are great for a housewarming, wedding, birthday, Mother’s/Father’s Day and Christmas. They also make wonderful business thank you gifts. Please contact us to customize your gift certificate for that special person or family. Please consider reducing your carbon footprint and eating healthier food by growing your own delicious vegetables and herbs. 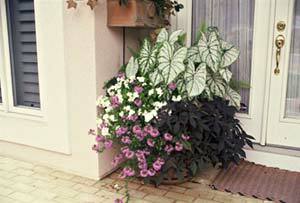 Spinach and lettuce can be grown in containers on a patio. Cherry tomatoes can be grown in hanging baskets! With our advice, organic vegetable gardening can be a low maintenance, enjoyable way to have fresh vegetables at your doorstep. Are you getting a home ready to put on the market? If so, we will work with you and your homeowners to give the exterior of their home a fresh look and set it apart from the competition. We keep strict budgets in mind and make suggestions that can be do-it-yourself projects. If workers are needed, we can recommend those, too. Oftentimes, one hour of our time can set the wheels in motion for a huge improvement without great expense. The first impression a potential buyer has is that minute when they drive up in front of the house, known as “curb appeal” Your landscaping is a large part of this first impression. Did you know that “50% of potential buyers make their decision within the first minute of being on the property”, according to a study done by the National Association of Realtors? We create detailed “blueprint” style drawings to scale for you. Some of our clients have even framed them! Accurately followed, our careful drawings make sure that what we conceived and put on paper is translated to your yard.